Paul Cummings was installed as master of Peace and Unity Lodge No 3966 at Cleveleys Masonic Hall witnessed by 67 lodge members and guests. Paul is taking the lead at an auspicious time for the lodge as it enters its centenary year. Stewart Seddon (left) congratulates Paul Cummings. The principal guest on this occasion was Assistant Provincial Grand Master Stewart Seddon and he was accompanied by the North Fylde Assistant Group Chairman John Cross, Bob Hall, Duncan Smith, Jim Woods, Giles Berkley together with eminent acting Provincial grand officers, Jim Finnegan, Peter Maxwell (the lodge’s director of ceremonies) John Riley and Mike Pinkard. 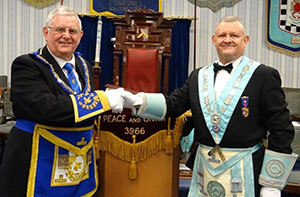 Alan Howie as WM opened the lodge and completed the administrative business of the lodge with due form. 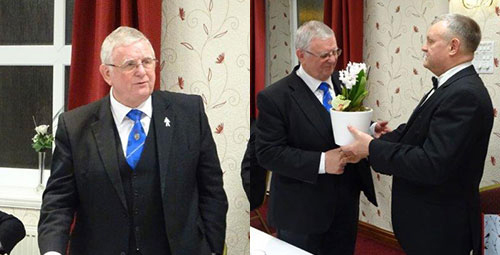 Alan asked the assistance of Ken Buckley to act as installing senior warden, Creag Williams to remain in his seat to install the junior warden and Steve Willingham from West Lancashire Century Lodge No 2349 as installing inner guard. The master elect Paul Cummings was presented by Giles Berkley. Paul completed his obligation without flaw and Alan Howie proceeded to install his successor with the director of ceremonies Peter Maxwell keeping a watchful eye over the ceremony as it unfolded. Stewart Seddon (left) shares a glass of wine with Paul Cummings. Once the inner-workings had been completed the brethren in turn delivered the working tools with the greatest of sincerity; the third degree working tools were delivered by Ian Watson, the second degree tools by Cameron Afzal and the first degree tools by Gerrard Maxwell. Once the proclamations were completed it was time for Giles to step up again and deliver the address to the master, an address that was a pleasure to hear. It was then Paul’s first job as master to invest his officers. The address to the wardens was delivered by Ken Buckley, whose many contributions to the evenings proceedings were without doubt a highlight. The address to the deacons, delivered by Glen Jackson, was a delight to behold, leaving the last and important address to the brethren of the lodge to Stewart Seddon. Once the formalities of the installation were completed Stewart rose to convey the greetings of the Provincial Grand Master Tony Harrison. Stewart thanked the installing master Alan not only for the work he had done in installing Paul but for his work throughout the year. It was then time for Paul to present Stewart with cheques; £1,000 to the Masonic Charitable Foundation 2021 Festival, £1,000 to Hope for Evie, £500 to the Sea Cadets, £207 to the West Lancashire Freemasons’ Charity, £359 to Making a Difference, £200 to the TramShed Theatre Company, £700 to the Cleveleys Masonic Hall Building Fund and a further £141 from the Ladies That Dine to Making a Difference, making an astounding total of £4,107. Steward Seddon (left) receives flowers for his wife from Paul Cummings. The brethren then retired downstairs for a convivial festive board in the Park Club’s dining facilities. 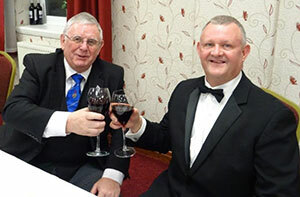 During the wine takings and toasts, Stewart responded to his toast by congratulating the new master and all the brethren who had taken part in the ceremony. He took time to praise the lodge’s director of ceremonies Peter Maxwell and Carl Splindler, the outgoing secretary, for their hard work. Stewart also wished the master and the lodge well in their centenary year. Stewart continued by saying that the overarching wish of the Provincial Grand Master is that brethren enjoy their Freemasonry. He said that it is Tony Harrison’s wish that we all support the important work of the Masonic Charitable Foundation 2021 Festival. Stewart said that he had noticed the number of brethren that were wearing their steward’s jewel in the lodge. He asked all those who are able to take out a pledge towards the festival to do so. He added that the charity had given a donation of £65,000 to a charity in the Warrington area called PAPYRUS which works with young people with depression and is dedicated to the prevention youth suicide. John Darrell (left) toasts Paul Cummings during the master’s song. Stewart moved on to the subject of the Royal Arch and said that the new enhanced exaltation ceremony made it a more interesting and visual ceremony and that the Royal Arch is an integral part of Freemasonry and an important step in a brother’s Masonic journey. Stewart proceeded to explain Solomon as a tool that is available on the United Grand Lodge of England website to Masons and non-Masons, and is an important new initiative to enable Masons to make a daily advancement in knowledge and which also has short lectures that brethren can deliver in lodge. Alan Howie proposed the toast to the master and the master’s song was rendered by John Darrell ably accompanied by the ever-tuneful Malcolm Burrill. A raffle held during the evening showed the generosity of the Masonic fraternity and raised a fantastic £355 to Masonic and non-Masonic charities, a great start to Paul Cummings’ year. Pictured from left to right, are: Peter Maxwell, Mike Pinkard, Jim Woods, Stewart Seddon, Paul Cummings, Bob Hall, Giles Berkley, Jim Finnegan and John Riley.